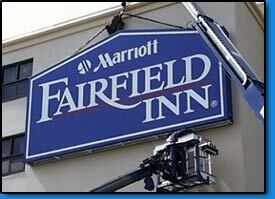 Hotels Restaurants Advertising Signs Washington DC Maryland Virginia | KERLEY SIGNS, INC. The quality of your advertising sign should be a reflection of the quality of your service. It tells your customers how much you care about them. Our artists can design a sign advertisement to fit in with your architecture and your image. No matter what your style is, our professionals will work with you to ensure that you convey the image you want. Possibly one of the most competitive industries today can be found in the hospitality industry. Hotels and restaurants are constantly relying on advertising, both word-of-mouth and other types. It is for this reason, that having the most effective advertising signage is imperative in enabling your business to flourish. When dealing specifically with the restaurant industry, having the proper signage can be the determining factor in the level of success your business achieves. Let our team of professionals help in creating a sign which will appeal to the consumers senses. Your hotel or restuarant sign should be both memorable as well as tailored to convey the type of service your business represents. Whether you're going for the rustic, brick oven look, or the contemporary abstract feel your sign must spark either curiosity or desire within the consumers who will view it. Making an attractive advertising sign which is easily remembered is useful simply due to the fact that establishments that are easily recognizable tend to attract a higher volume of traffic. The same holds true for those establishments in the hotel hospitality industry. Let our professionals work with you to help tailor a sign which best accommodates your architecture as well as type of clientèle you're aiming to attract. For example, the business oriented guest may find different styles ideal when compared to the family oriented guest. Also, as previously stated, having memorable adveritising signs will aide in bringing in guests to a larger number of locations, boosting sales. A well designed sign can also tell your customers exactly how much you care about them. So when designing your next restaurant / hotel sign, let the Professionals at Kerley Signs provide you with a little something that will separate you from the competition.